The class of 2018-19 will celebrate the end of its studies with its graduation gala at 5:30 p.m. May 1 at Bradley Hall in downtown Greenfield. The 23 members of the class will present summaries of their community projects after dinner, which will be catered by Jim and Maria Dawson. A cocktail hour begins at 4:30. Admission, which is $20, is payable at the door via check or cash. Mary Meek, Greenfield Banking Co.
Susan Wildey, Greenfield Banking Co.
Hancock County Sheriff Brad Burkhart’s new leadership team has a deep connection to Leadership Hancock County: Four of the five top officers are graduates or current students in Leadership. Two of them are members of the LHC board of directors. 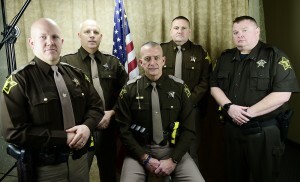 Bobby Campbell, who will be chief deputy — second in command at the department — is a past president of the board of directors and graduated in 2012. Campbell still serves on the board. Robert Harris, who will be road captain, is a member of the Class of 2017. Ted Munden, who will head the investigations division, is a member of the Class of 2018-19. The fifth member of the team, Keith Oliver is the jail commander. The class of 2018-19 enjoyed a busy History Day in December, with a morning of presentations on the county’s past and an afternoon bus tour that touched all four corners of the county. Brigette Jones, a historian and the county director of tourism, narrated a rolling tour of county historical sites. Greenfield-Central schools provided a bus for the tour. who discussed historic photos of Greenfield captured by Mayor Ora Myers around 1910; Deana Hudson of the Hancock County Cemetery Commission, who talked about the county’s 92 pioneer cemeteries; and Paul McNeil, a librarian who talked about the county’s collection of genealogy records. In the afternoon, the class boarded a bus — donated for the afternoon by Greenfield-Central schools — for a rolling tour. 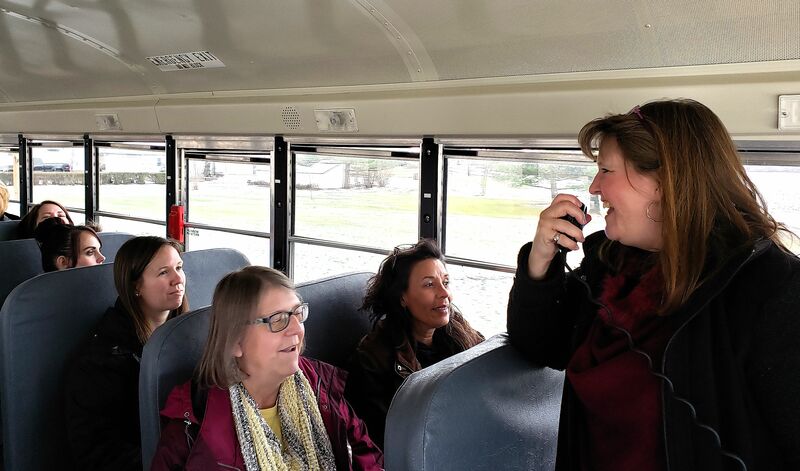 Narrated by Brigette Jones, a historian and the county tourism director, the tour offered a trove of trivia and other interesting facts about county history. The tour stopped at four places: the Octagon House in Shirley; the Fortville-Vernon Township Library; the New Palestine museum; and Nameless Creek Youth Camp. The class of 2018-19 learned how fast hard-earned money can disappear like candy. 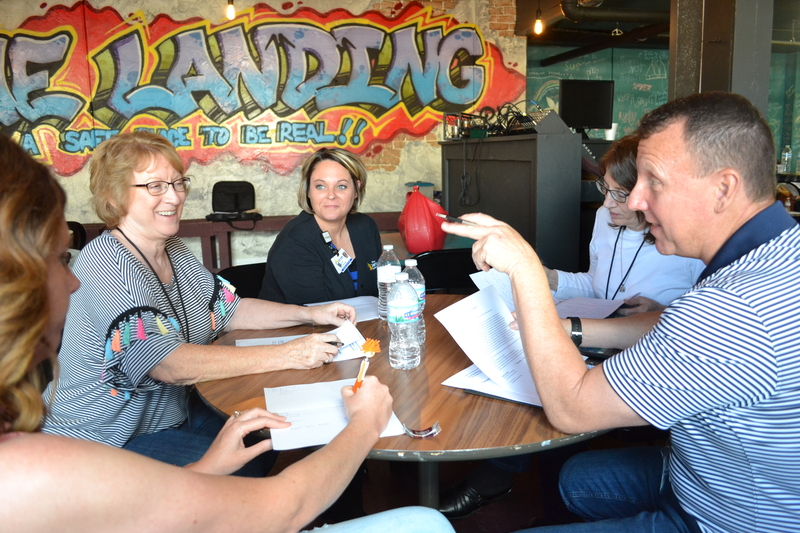 The metaphor was applied literally during a poverty simulation on Community Issues Day on Oct. 3. On a class day devoted to understanding Hancock County’s safety net and the nonprofits that work to keep it in place, the class’s first exercise of the day was to figure out how to stretch a paycheck across all the needs a family encounters. Instead of money, the class members used Smarties candy, “spending” 15 pieces of candy on housing, transportation, food and other needs. Once their budgets were tapped out, facilitator Paula Jarrett, CEO of PSJ Consulting LLC, introduced the real lesson: She told each “family” to wipe four Smarties off their grid of needs. The class members struggled to re-prioritize their spending to cover all their expenses. The result: As happens in the real world, these simulated families had to do without. The exercise was an eye-opener for a number of class members, who haven’t suffered such struggles before. That was the idea of the exercise and the rest of the class day, which included visits to the Hancock County Food Pantry, Hancock Hope House and the Kenneth Butler Memorial Soup Kitchen. They also sat in on roundtable discussions with the CEOs of six county nonprofits who provide services to those in need. The Landing Place in downtown Greenfield played host to the class. Jarrett and Lori Cooley of Hancock Regional Hospital were day chairs for the session. 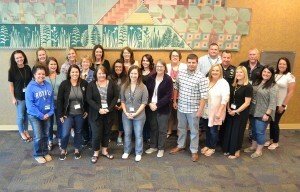 Twenty-three members of the new class of Leadership Hancock County began their studies on Sept. 13-14 with a lively retreat that included thought-provoking seminars and team-building exercises. Greg Woods (left), Nick Riedman and Staci Starcher, members of the Class of 2018, present a summary of their community project during the class’s graduation celebration. The three were part of Team Debate, which successfully put on five political debates last spring as part of its project to create county debate committee. The committee will soon be planning debates in this fall’s general election. HANCOCK COUNTY – Leadership Hancock County is reaching out to nonprofits and other community groups for ideas for community projects. Enrollees in the leadership academy, which begins its 2018-19 program on Sept. 13, undertake community projects as part of the curriculum. The projects help class members apply lessons they’ve learned in leadership and teamwork. They also help the organizations. Community groups are encouraged to submit proposals. They can run the gamut, from helping conceive and put on events to coordinating improvements at nonprofits’ facilities. Projects last year included an insect/bird garden at the Hancock County Public Library; a redesign of the offices of Bentley’s Buddies and Friends, a reading program for children; and creation of the nonpartisan Hancock County Debate Commission. You can look over all our past community projects by clicking on the “Projects” tab at the top of our home page. Deadline to submit project ideas is two months earlier this year: They are due Sept. 7. Applications are available by clicking on the “Applications” tab at the top of our home page. Projects will be unveiled to the class on its Community Issues Day, Oct. 3. Leadership Hancock County is a tuition-based program that works to identify and nurture emerging leaders. Founded in 1996, it has graduated more than 400 people, including many who have gone on to prominent leadership roles in community organizations, businesses, schools and government. More information is available online at www.leadhc.org. You also can send email to info@leadhc.org. One of the unsung stories about Leadership Hancock County is the contributions by our corps of dedicated sponsors. 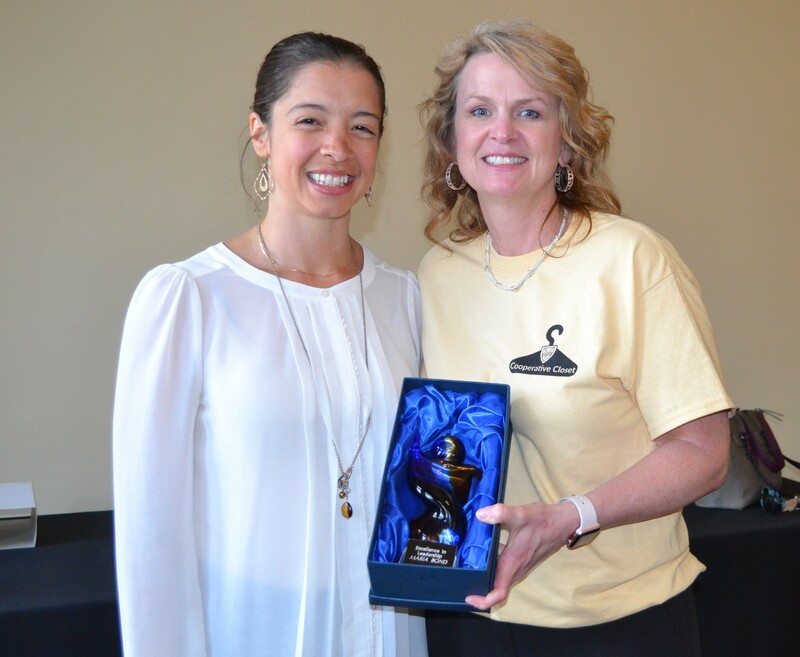 Without their help, our program would not be as strong and enriching as it is. 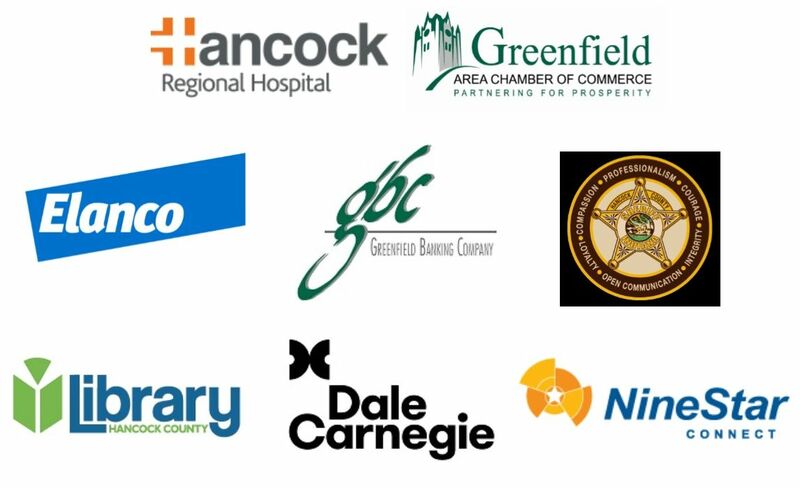 These organizations contribute time, services and, yes, money to support Leadership Hancock County. With their help, we are able to provide comfortable venues for our classes and other events; meals and snacks for the eight daylong programs; and tuition to support the enrollment of some class members. Their investment in Leadership Hancock County shows their commitment to making Hancock County a better place. 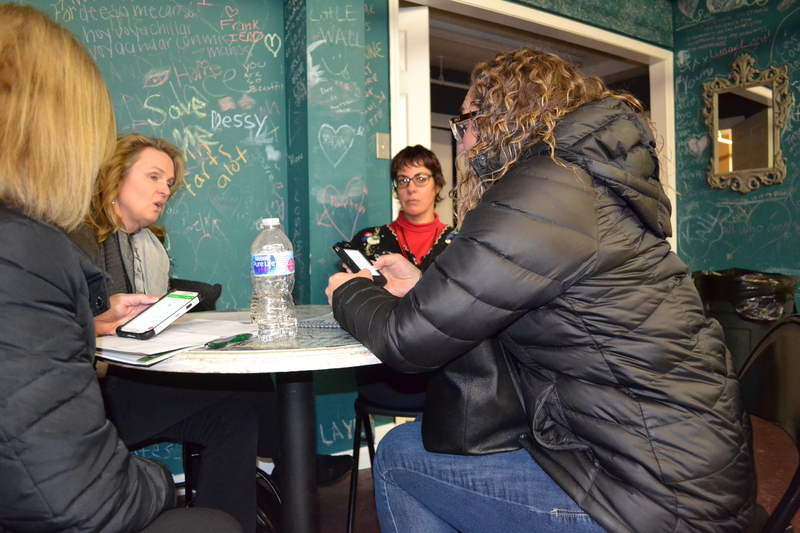 Linda Thakrar (left) Maria Bond, Stephanie Haines and Stephanie Wilson go over their calendars as they begin setting up their first meetings to discuss their project. The four will work to establish a clothing bank in the Mt. Vernon schools for students who need fresh clothes during the school day. Members of the Class of 2017-18 are diving in to their community projects. The six projects were unveiled at the end of Community Issues Day on Wednesday, Dec. 6. They cover a wide variety of issues — from childhood literacy and health to horticulture and politics. A key part of the Leadership experience, the projects will give class members the opportunity to work in small groups as they take on initiatives designed to better the community. The projects were proposed by various groups and class members themselves. In all, 20 proposals originally were submitted for consideration. A committee of the LHC board of directors chose the projects for the class in mid-November. The project teams will work to complete their projects in April and will present their results during presentations at graduation on May 2. Transform the offices of Bentley’s Buddies and Friends, a program to encourage young readers, into a kid-friendly environment. Bentley’s Buddies trains dogs and their owners to spend time with children, who read to the dogs in an environment that helps them build confidence. The program visits classrooms and also works out of an office in downtown Greenfield, especially when school is not in session. The Leadership team will design and present to the organization ideas for decor and will organize a volunteer effort to redo the office space to make it a more kid-friendly atmosphere. Team members: Alex Bush, Medicap Pharmacy; Chris Carter, Hancock Regional Hospital; Cara Fields, Elanco Animal Health; Tracy Sweet, IU Health. Create a pilot program to keep school health offices well-stocked with emergency clothing stores in the event of playground accidents, dress-code issues, bathroom emergencies, etc. The program would begin in the Mt. Vernon schools and would be built so it could be used in districts countywide. Health offices already collect clothing items for emergency needs, but schools have trouble keeping the stores stocked because the items are rarely returned. Goals include possibly creating a district “clothing bank”; working with organizations to sponsor clothing drives; and appealing to area businesses for donations. Team members: Maria Bond, Mt. Vernon schools; Stephanie Haines, the Daily Reporter; Linda Thakrar, Hancock County Public Library; Stephanie Wilson, Hancock Physician Network. 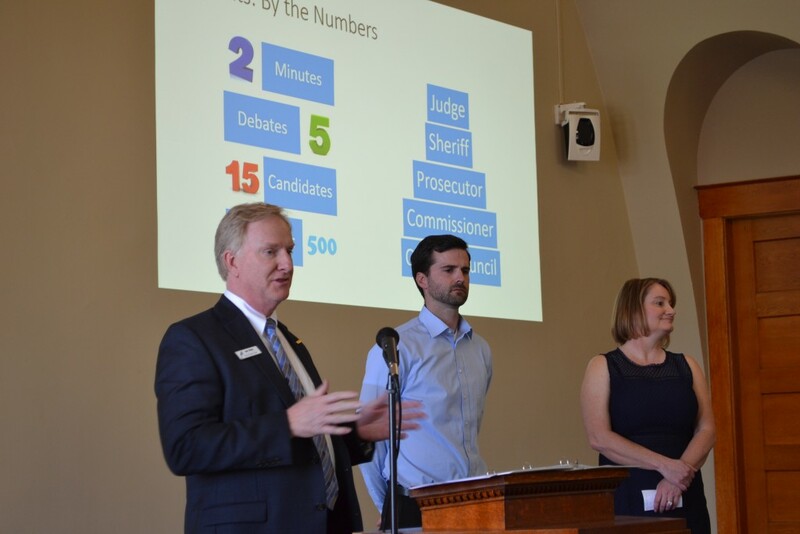 Create a Hancock County Debate Commission, which will be a nonpartisan entity that will organize and oversee political debates in key local and regional elections. The Leadership Hancock County team will write by-laws; recruit a board; and hand off responsibility for the debates before the primary election next May. Team members: Nick Riedman, city of Greenfield; Staci Starcher, town of McCordsville; Diana Trautmann, Elanco Animal Health; Greg Woods, Greenfield Banking Co. Create a garden with native plants outside the window of the Nature Nook area of the Children’s Department of the Hancock County Public Library’s main branch. The garden will be designed to attract wildlife such as birds, bees and butterflies. The Nature Nook of the library was designed in 2015 to bring the outdoors inside with a view finder and interactive displays. A large swath of unused library property nearby also could be developed to attract pollinators and wildlife that would be visible from the children’s area. Team members: Kelly Leddy, MainSource Bank; Jena Mattix, Hancock County Public Library; Courtney Miller, Jane Pauley Community Health Center; Renee Oldham, Mt. Vernon Education Foundation. Start the “5210” program in county public schools. The 5210 program is an educational effort that strives to assist children in making healthier choices. The program educates children to aim for eating 5 fruit or vegetable servings every day; keep recreational screen time to 2 hours or fewer each day; include at least 1 hour or more of physical activity each day; and consume 0 sugar-sweetened beverages while drinking more water every day. The Leadership team will work on rolling out a pilot program to one age level — likely younger students — in one of the school systems. A school will first have to be identified and stakeholders engaged. Team members: Angela Flench, Indiana Department of Transportation; Christy Harpold, Greenfield-Central schools; Dr. Jason Hua, Jane Pauley Community Health Center; Adam Wilhelm, Hancock Regional Hospital. Revamping the Leadership Hancock County Scavenger Hunt, which is a key part of the organization’s team-building retreat each fall. The team will be tasked with incorporating technology and social media into the activity to make it more interactive for participants. Possible upgrades also include using geo-caching or some sort of GPS component to highlight teams’ progress during the hunt. The group also will write a brand-new trivia test. Team members: Diane Petry, Life Choices Care Center; George Plisinski, NineStar Connect; Jason Wells, Hancock Regional Hospital; Stacey Wixson, Greenfield Banking Co.